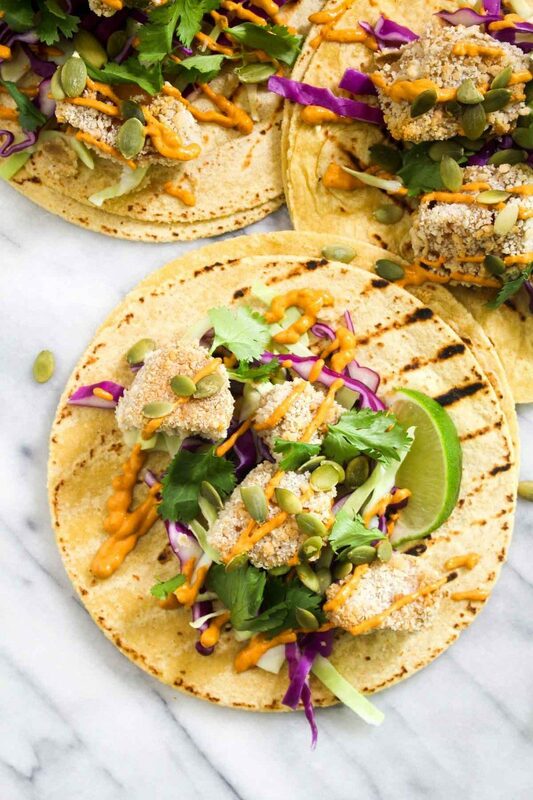 These Crispy Pumpkin Tacos will spice up taco Tuesday with their smokey Chipotle Lime Crema. This recipe is vegan, gluten free, and healthy! Preheat the oven to 450 degrees. Spray a baking tray with nonstick cooking oil. Set aside. Set up your breading stations. In one bowl, whisk together the almond milk and a pinch of salt and pepper. In a second bowl, stir together the oat flour with a pinch of salt and pepper. Add the breadcrumbs to a third bowl. Take 3-4 pieces of pumpkin and dunk them into the almond milk. Shake off any excess liquid and coat them in the oat flour. Shake off the excess and dunk them back into the almond milk. Next, set them into the breadcrumbs and roll them around to coat. Place them on the baking tray. Repeat until all of the pumpkin is breaded. Spray the breaded pumpkin with the nonstick cooking spray to encourage browning. Bake for 15 minutes, flip, and bake for another 15. While the pumpkin is cooking, add all of the chipotle crema ingredients into a high speed blender. Blend until smooth. Once the pumpkin is finished cooking, serve the tacos with desired toppings.